In this fun monster truck game you will participate in the trials that reunite all the adrenaline junkees that own an indestructible truck. You are one of these and with each challenge you have to try and set a new record that others cant pass. First challenge will be a high jump challenge and you have to try and reach as much air as you can. In the limited amount of time you will have to try as many times as you can to better yourself and then advance to the flip challenge, long jump challenge or the obstacle challenge where you have to reach the end of the level as fast as you can. The truck can not be destroyed so you can land any way you want as long as you get back on it and try again. The track is limited so you have to find the best ramp for each challenge and set the records there. 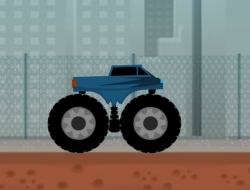 Use the arrow keys to drive the monster truck. Monster Truck Trials 0.00 between 0 and 10 based on 0 votes.